You are here: Home / All Freebies / Technology Project? Help! Where do I start? 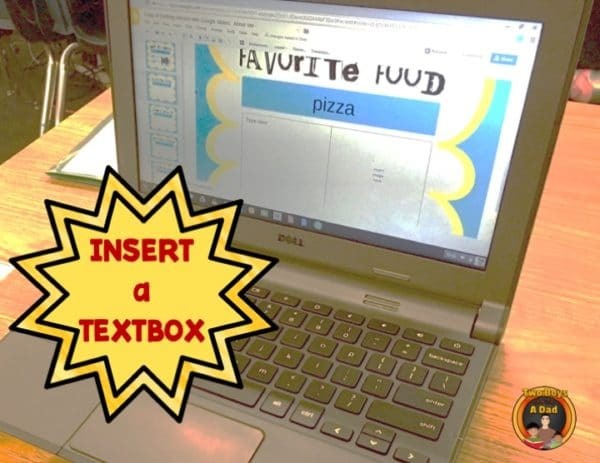 Need a simple but effective technology project to get your students started? 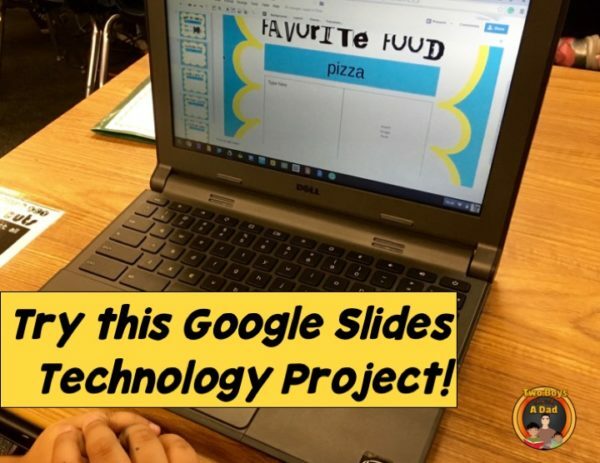 I’ll show you how you can use Google Slides with your elementary students using a fun technology project. I use this technology project to teach the basic skills for any of the Google Apps. I’m in a 1:1 classroom with a Chromebook cart so my students need to get up to speed with technology as soon as possible. This technology project can be completed in a few days but can also be used as an extension activity all year long! For this technology project, the teacher should have a basic understanding of how to use Google Slides. 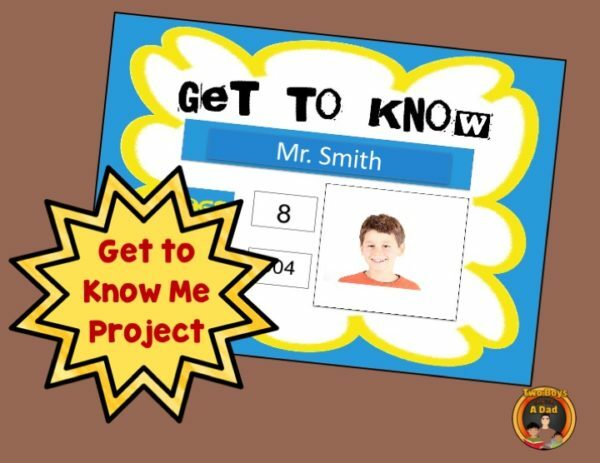 The technology project involves using a Google Slides template to complete a “Get to Know Me” presentation. 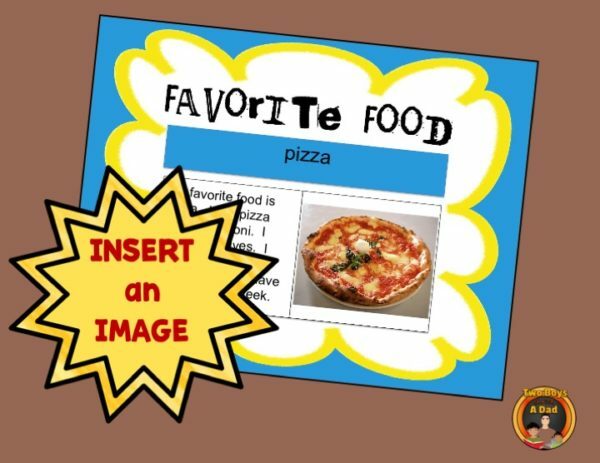 By completing this project, students learn how to create a text box, resize fonts, search for and insert images, resize images and much more. These are all basic skills needed to use across Google Docs, Google Slides and Google Sheets (the basic Google Apps). I’m offering the Google Slides template as a FREEBIE. Keep reading to see how to get it for your class! The template can be used at any time of the year, but I like to use it right at the beginning to get a running start with a technology project. What’s included in this Google Slides Technology Project? I’ve also added one extra blank slide for the students to continue to add more personal information such as favorite sport, places I’ve been, or any other part of their life they’d like to share. Students can continue to add blank slides by duplicating this last slide. This can be done all year long as an extension or early finishers assignment! When you download the link to the Google Slides template, you will get all six slides. You can add or delete the slides you wish. How do the students work on the slides? I complete the first two slides with the students. I assign the template through Google Classroom. From there, each student opens their own copy. On the first slide, I teach them how to create a text box, resize it and type text. Then I teach them to chose a different font, resize it and even change the color. 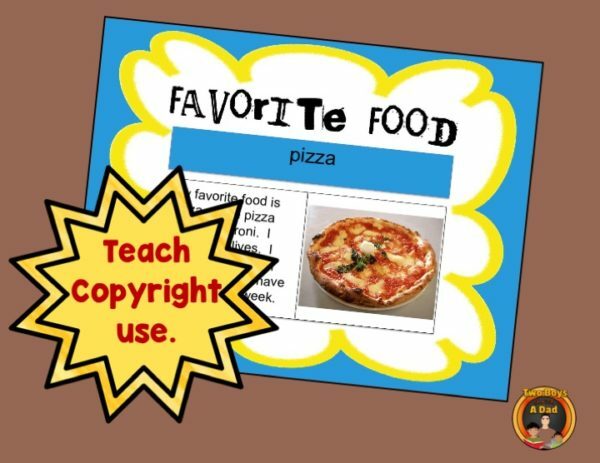 On slide two, the students practice again creating a text box and adding their text. Then I teach them to insert an image by searching for it on the web. You can search directly from within Google Slides as there is an option for that under the insert menu: INSERT>image>search the web. Once the image is found, selected and inserted I then teach them how to resize it. We also talk about what is an appropriate image. This is also the time I review copyright laws and fair use. 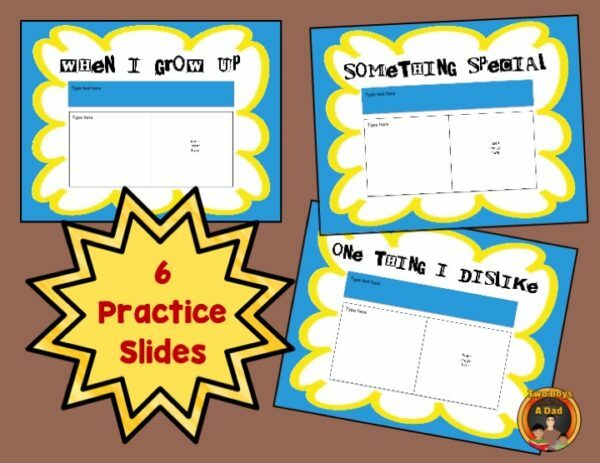 For the rest of the slides, the students then practice those skills by continuing to work on each slide at their own pace. This allows me to work with a small group or individuals who might need more instruction on this technology project. What’s the purpose of this technology project? In my classroom, this technology project serves two purposes. One, it teaches the students the most basic skills needed to use across all the Google Apps. Secondly, it creates a mini-biography of the student which I use for their writing folder. In my classroom, the writing wall has a large envelope for each child. I’ve cut away part of it so the writing shows. On the front of the envelope is a paper template that I glue on with the child’s name and picture. 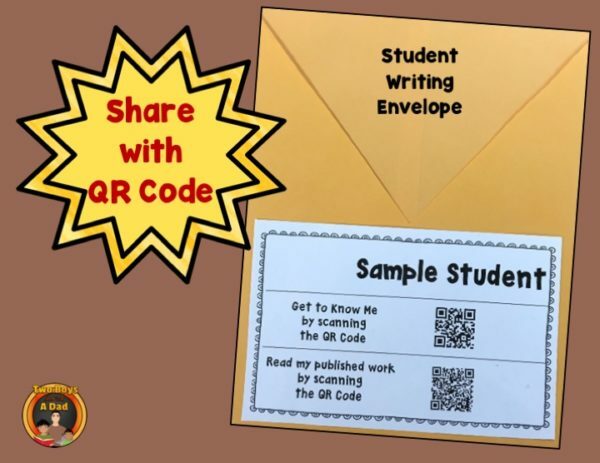 But it also has a QR-code that links directly to THEIR Google Slides “Get to Know Me” presentation. That means anyone (such as parents, visitors and even the district superintendent) can scan the code with their phone and instantly learn about the author. It’s great to have at Open House, too! How do I get the Google Slides template? Click on this LINK to download a PDF file. The PDF file will contain a link to the Google Slides template. When you click on the link, you’ll be asked to make a copy of the file to your own Google Drive. Make sure you are logged into your Google account. If you don’t have a Google account, you can create one for free. You can distribute the template to your students via Google Classroom or email it to them as a file. Part of this article originally appeared on this blog post on my blog. This project is appropriate for grades 3 – 5 though I’ve also successfully used it with second graders. 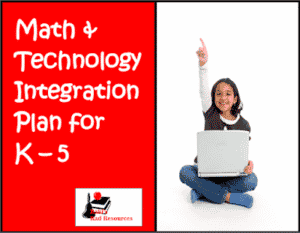 I know your students will have fun completing this technology project! Welcome and bienvenidos! I am Claudio Enriquez, a teacher, blogger, a Teacher Pay Teachers author, and single-dad raising two boys in sunny Southern California. I have served as an elementary literacy coach, mentor teacher, and a Bilingual Resource Teacher. I'm currently a Math Coach working with pre-K, kindergarten, first and second-grade teachers. I've taught for over 30 years in first, second and third grades. I've had the opportunity to be in a 1:1 classroom for four years with a Chromebook cart! 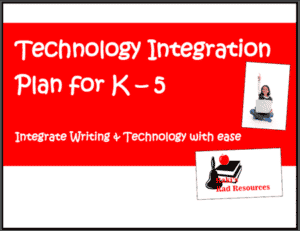 Infusing technology into different parts of the curriculum is a passion for me. Call me Mr. Google! You can read more about how I infuse technology at www.twoboysandadad.com. If you need more ideas about how to use technology in the classroom, then check out my Pinterest profile. Wow, this is great! Saving this for sure. Thank you.